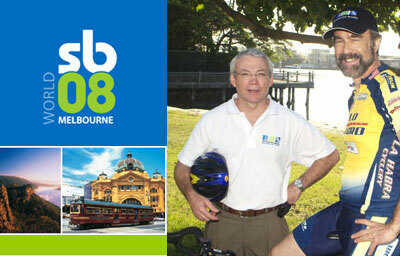 Ben Schwegler (right), a keen cyclist, pictured with Keith Hampson. Construction Innovation’s Chair John McCarthy is Chair of the 2008 World Sustainable Building Conference (SB08), the peak gathering of the world’s leading experts and industry practitioners in ‘green’ building. Up to 2,000 people are expected to attend the conference, which will be held in on 21-25 September at the Melbourne Convention Centre. Construction Innovation is also sponsoring the event and will run a Special Forum at the conference. Several international speakers with a breadth of expertise in the area of sustainability have been confirmed to address the conference. These include Rosario Marin, a Cabinet member in the state government of California and chair of Governor Arnold Schwarzenegger’s Green Action Team; Prof. Bill Rees, originator of the concept of ‘ecological footprint’; and Mr Douglas Durst, a pioneer of the green building movement. Mr Durst is the developer of the Bank of America Tower in New York, which will be the most environmentally advanced office tower in the world. The conference will also feature a number of Special Forums that will explore emerging trends and challenges in sustainable building, such as sustainable urban refurbishment, climate adaptation issues and strategies for the built environment, and the role of rating tools in transforming the green building market. The Special Forum being organised by Construction Innovation will focus on maximising opportunities from innovations and integrated processes in the planning, design, delivery/construction and management of the built environment. A keynote speaker in this session is Dr Ben Schwegler, Chief Scientist of Walt Disney Imagineering R&D, and a consulting professor at Stanford University. From hydrological modelling to 4D software and integrated infrastructure design, Dr Schwegler is passionate about inventing new technologies to improve the quality of the built environment. Dr Schwegler’s address to Construction Innovation’s Third International Clients Driving Innovation conference held on the Gold Coast in March proved a thought-provoking highlight of the conference and we are delighted that he is able to return to Australia for SB08. The World Sustainable Building Conference series is held every three years, and is an initiative of the United Nations Environment Program (UNEP); the International Council for Research and Innovation in Building and Construction (CIB), headquartered in the Netherlands; and the International Initiative for a Sustainable Built Environment (iiSBE) based in Canada.